Unboxed LEGO Star Wars: The Complete Saga (Nintendo DS, 2007). Condition is acceptable. Will be sent second class in an envelope. It doesn't matter what century it is. With that in mind, Infinity Ward has taken its ever popular Call of Duty series out of the 1940s and World War II and into the modern era. See, the stylus isn't just for performing cute puzzle-type tasks, it can be used to defend democracy too! With 20 different missions for players to conquer, players can use the Nintendo DS microphone to distract and surprise enemies. The detailed graphics are presented on both screens, with a view from behind the character on teh top scrnee, and a bird's eye view on the bottom screen. Other classic songs include hits from REM, Foo Fighters, Queen and Smashing Pumpkins. The Clone Wars Republic Heroes is set in after the Occupation of Ryloth and bridges seasons one and two of the Clone Wars animated TV series, which ran from 2003 to 2005. Or, rather than destroy enemy droids, you can commandeer them, and use their abilities to help you complete the level by blasting enemies and solving puzzles. 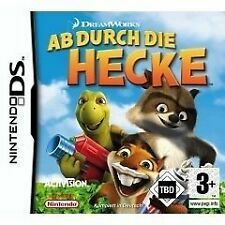 Over The Hedge (Nintendo DS, 2006) - European Version. Condition is Good however the box has seen better days! Dispatched with Royal Mail 1st Class Large Letter. New and Sealed. Kid friendly. Perfect kid friendly present. 007 QUANTUM OF SOLACE (16+) - NINTENDO DS - NEW/SEALED - FREE P&P!! 5 out of 5 stars - 007 QUANTUM OF SOLACE (16+) - NINTENDO DS - NEW/SEALED - FREE P&P!! 1 product rating1 product ratings - 007 QUANTUM OF SOLACE (16+) - NINTENDO DS - NEW/SEALED - FREE P&P!! Need to get in touch?. Region: Region Free. 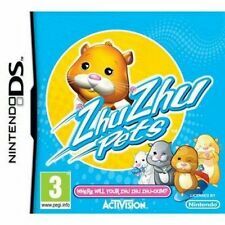 Over The Hedge for Nintendo DS. Complete with Manual. Bond is Back! Based on the "Quantum of Solace" and "Casino Royale" films, Quantum Solace places you in the ruthless world of international espionage and intrigue. Original UK version, complete with case, covers and instructions. This listing is for- Transformers Autobots Nintendo DS Video Game 2007 - European Version. Used in good condition. Missing booklet. Comes as seen in the photos. If you have any questions feel free to message me and I will get back to you as soon as possible. If you could please look at my other listings it would be appreciated. QUANTUM OF SOLACE. You are the new Bond: Employ all of you Bond skills in high-octane combat, chaotic gun fights and precise stealth take-downs. Both look to be in good condition fast postage. Used and Tested on a Nintendo DSI XL see pictures. Transformers: Autobots for Nintendo DS Complete - Good Condition. Condition is Good. Dispatched with Royal Mail 2nd Class Large Letter. TESTED ON A DS. NTR-CQSP-EUR AGE 16 . 13 playable furry friends to choose from and customise, go on quests, build and create. Compatible with all Ds systems including 3Ds but will only play in 2D. USA edition that plays on UK and Worldwide Ds handhelds. The fate of the world rests in the hands of ONE super-powered teenager. Platform: Nintendo DS Handheld Console. Transformers: Decepticons (Nintendo DS, 2007) - European Version. Condition is Like New. Dispatched with Royal Mail 2nd Class Large Letter. 007: Quantum of Solace (Nintendo DS, 2008) - European Version. Condition is Like New. Dispatched with Royal Mail 1st Class Large Letter. Genuine UK / PAL Version. Good clean condition. Transformers: deceptions. Condition is Good. Dispatched with eBay delivery – Shutl 2-3 days. Many more Nintendo DS bargains for sale. Band Hero NIntendo DS GAME Full Band Experience Brand New Guitar Grip Drum Grip. Condition is New. Dispatched with Royal Mail 1st Class Large Letter.